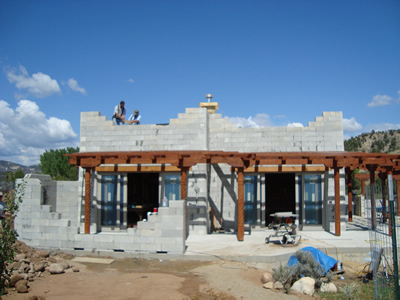 Lefthand Masonry is a specialized Masonry contractor based in Colorado but willing to travel throughout the United States. We design and build masonry homes, masonry heaters, wood fired bake ovens, fireplaces and can do any type of custom masonry work utilizing brick, stone, concrete masonry units, tile and aerated concrete block. 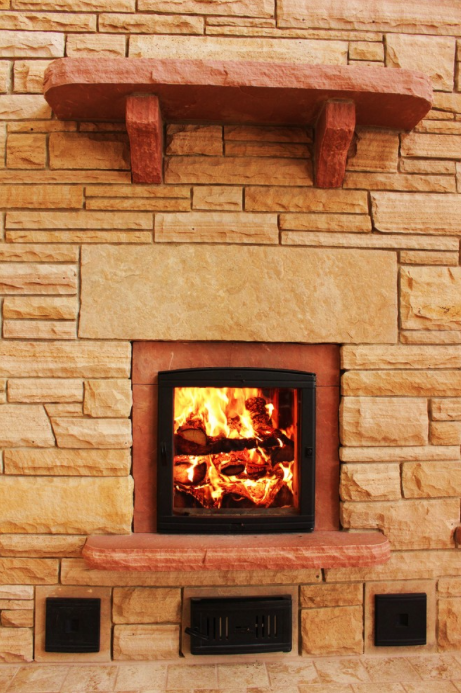 WHAT IS A MASONRY HEATER? A masonry heater is a heating device built primarily of masonry materials that consists of a fuel fire box and a series of heat transfer channels or flues that capture all of the heat from a fire and gently radiate the heat into the home. The basic principle of all masonry heaters is to use a small amount of fuel to burn a very hot fire that heats up a large mass of masonry which in turn heats a dwelling for a long period of time. The heaters are designed to efficiently burn wood and its gases in a firebox after which the hot, low pollutant gases pass through a series of internal heat transfer channels heating the entire masonry structure. The heaters are designed to burn 1-2 fires per day allowing the heaters to gently radiate heat for a 12-24 hour period, long after the fire is out. Masonry heaters generally do not exceed 200F on the outside making them not only safe, but quite enjoyable to touch. Heaters can be custom built to meet a homeowner’s needs. Masonry heaters can be built in a variety of shapes and sizes and can contain bake ovens, cook stoves, and heated benches. They can be built to heat entire homes, or smaller units can be built to heat individual rooms or spaces. WHY CHOOSE A MASONRY HEATER? Masonry heaters utilize one of our most abundant renewable energy sources. Masonry heaters are the cleanest, most efficient and comfortable way to burn cordwood. Masonry heaters are the heart of a home, providing a functional centerpiece where family and friends can gather. Masonry Heaters only require 1-2 short fires per day, making heaters the safest, easiest, and most convenient way to burn wood. Heaters work harmoniously with passive and active solar heating systems. Finnish: Finland has a long history of Masonry heaters. The Finnish stoves or Finnish fireplaces are most often called contraflow heaters. In these stoves, flue gases leave the firebox travel up through a throat and into a secondary combustion chamber where remaining unburned gases are burned before traveling back down heat exchange flues on each side of the heater. The gases then exit the stove through a chimney connection at its base. Contraflow heaters are often built with black or white bake ovens and/ or heated benches. Russian: The Russian heaters we build are called bell heaters. Bell heaters work on the principle of free gas movement, which was first theorized for masonry heaters in the early 1900’s. The basic principle is that gases fill up a volume of space no matter the size or the shape with hottest gases rising to the top of the container and cooler gases sinking to the bottom. Using this principle in a stove, the container or bells can be made within a tolerance of sizes, allowing bell heaters to have an array of shapes and sizes, with much flexibility in design. Using free gas movement principles allows a stove to work without as much dependence on the draft of the chimney. This characteristic sets them apart from other designs. These heaters can also have black or white bake ovens and heated benches. Swedish: Sweden has a very long history of masonry heaters many of which are beautiful ornate tile stoves. Swedish stoves are said to be the first stoves with down draft channels and Finnish stoves evolved from Swedish designs. A common design of Swedish origin is for flue gases to go up a throat down the front sides of a heater and back up the rear sides before exiting at the top of the stove. This is referred to as a Swedish Five Run. Austrian: Austria has a very rich masonry stove history and is most famous for their kachelofens, though many of their stoves are actually grundofens. Kachelofen’s are tile stoves while grundofens are plaster/stucco heaters, but the core of the units are built in the same way. Austrian stoves are built using scientific calculations and the Austrian guild even has a computer program for calculating all dimensions of the firebox and flues. These stoves can be built in practically any shape or size but are traditionally only finished in tiles or plaster because of the way they are constructed. Soapstone can be easily adapted to work well for a veneer on Austrian style heaters. Rocket Stoves: Rocket stoves have gained popularity as a low cost heater design. Rocket stoves originally consist of a top loading J shaped firebox/throat that exited into an upside down 55 gallon drum that release the gases into a long heated bench before exiting a chimney. Max Edelson has lead recent research on masonry rocket stoves which replace the 55 gallon drum with a masonry drum and double skin walls instead of the traditional single skin. These heaters parallel Lars Helbro’s heater designs in Denmark. WHAT IS A MASONRY HOME? A masonry home is a home built using structural masonry walls rather than wood framing. The walls can be made of AAC block, CMU block, brick, stone, adobe or any combination of these. Masonry homes incorporate the thermal mass of masonry with insulation to create highly efficient building envelopes. WHY CHOOSE A MASONRY HOME? Masonry homes define sustainable building as the homes can last for countless generations. Masonry walls are fireproof, excellent for mountain and wooded building sites. AAC Block are considered a green building material. Properly built masonry wall systems are highly energy efficient. Masonry wall systems are cost competitive to traditional framed homes and provide long term savings. Besides the many thermal benefits, masonry homes are very comfortable homes as the thick walls give people a sense of comfort and security while giving the house great acoustic qualities. Masonry homes can be finished in a large variety of veneers including brick, stone and stucco. Pizza Ovens: Pizza ovens are generally round ovens with a dome ceiling built from firebrick, castable refractory high temperature concrete, or clay. Pizza ovens generally have less mass than bread ovens and use live firing, where a fire burns while the food is cooked. Bread Ovens: Bread ovens can be built in a variety of ways but are most often built square or rectangular in shape with an arched barrel style ceiling. Bread ovens are designed and built specific to a client’s needs, with varying amounts of thermal mass. Bread ovens rely on the heated thermal mass of the oven to cook the food as there is no fire burning while the bread or pastries bake. Multi-use Ovens: Multi-use ovens are the most practical ovens for home bakers and enthusiasts. These ovens can be built in a variety of shapes and sizes, built inside or outside, and can be used for any style of wood fired baking. The ovens can be dome, arch or barrel style ovens with a variety of exterior finishes and styles. The ovens generally have more mass than a traditional pizza oven, but less than the traditional bread oven, and the mass can easily be adjusted to accommodate client’s needs. White Ovens: An oven that is heated by fire and hot flue gases traveling around the oven, with no smoke or flames in the oven. These ovens are usually built into a masonry heater. Black Ovens: Ovens that either have a fire in them or have hot flue gases passing through them in order to heat the masonry walls and floors. Autoclaved Aerated Concrete (AAC) blocks are structural masonry building blocks that can be used to build highly efficient building walls. AAC blocks are economical, sustainable, solid blocks that provide thermal and acoustic insulation as well as fire and termite resistance. AAC block contain 1/5th the material and are 1/5th the weight of conventional concrete. The blocks contain not only thermal mass which help store heat, but R value, or insulation, from the millions of air bubbles in the block. AAC Block are a non-organic, non-toxic, airtight material, which according to the manufacturers, generate no pollutants or hazardous waste during the manufacturing process. Aerated block are considered a green building material because of their energy efficiency, they require less raw materials than similar materials, and some contain recycled material. The block walls are competitive in price to conventional wood framing. Lefthand Masonry can take on any type of custom masonry project that a client seeks. Masonry is not only a trade but an art, and we have the knowledge, education, experience and skills to undertake any masonry project. We can do any style of stonework, and can use any brick bond to create exactly the look you want.